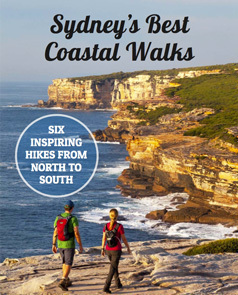 Inspiration and information on the best Sydney walks, harbour hikes, bush, beach and coastal walks. We’ve spent a lifetime enjoying Sydney's hiking trails and believe the best natural beauty can only be accessed on foot. So come with us as we share the best Sydney walks near the city and surrounds. It’s possible to walk from Barrenjoey Headland at the very northern tip of Sydney all the way down through the city centre to the eastern beaches of Bondi and on to Cronulla and Royal National Park in the south. The entire Sydney Great Coastal Walk from north to south is a challenge deserving to be on your wish-list, but we won't overwhelm you with every single Sydney walking track. We've selected only the best Sydney walks ranging from several kilometres, to overnight hikes. To make it easier for you to find the best walks in Sydney, they are divided into walking styles, location and distance. While we're adding to these lists of Sydney hiking trails all the time, be assured that each featured is one of the best Sydney walks, absolutely worth your time. Keeping it simple, here are all the best walks in Sydney in alphabetical order. Or read on to find a walk sorted by category or style. With more than 100 beaches in Sydney, including surf beaches and sandy harbour coves, there are many beach walks to choose from. Here are some Sydney beach walks to get started. Barrenjoey Lighthouse Walk. While this walk traverses only a small sandy section of the beach to get to the track's start, the views from the lighthouse over Palm Beach are spectacular. Bondi to Coogee Walk. At the opposite end of the spectrum, Bondi is one of Sydney's most popular and populous beaches. But somehow, this six beach walk makes Sydney feel fresh and new. You can also do the shorter Bondi to Bronte Walk, and still enjoy three beaches along the way. Figure 8 Pools. Once upon a time, only insiders knew to keep walking around the rocky headland of Burning Palms Beach in Royal National Park. Jibbon Beach Walk. One of the few beaches in Sydney where it's possible to leave the first footprints each day. You'll walk the length of this quiet, sandy beach to get to the Jibbon Aboriginal engravings. Manly to Bondi Walk. Why not walk between Sydney's two most famous beaches? You also have the added bonus of walking Sydney's entire harbour foreshore east of the bridge. Mona Vale Beach to Narrabeen Beach Walk. Way up on the northern beaches, there's a slice of local beach life worth exploring. Palm Beach to Manly Walk. Walk the full length of Sydney's northern beaches from Barrenjoey Headland to North Head. With over ten beaches to walk along you might like to take two or three days. Royal National Park Coastal Walk. There are another 14 beaches to discover in Royal National Park, many of them only accessible by foot. Sydney's Great Coastal Walk Why not walk along every one of Sydney's surf beaches and harbour beaches east of the bridge? It will take between a week or two, so plan it carefully. The Spit to Manly Walk. This walk finishes at a popular beachside area – Manly – but along the way reveals hidden harbour beaches worth pausing at. Bradleys Head Walk. A ferry across Sydney Harbour gives access to a short walk with big views of iconic Sydney (Harbour Bridge and Opera House included). Manly to Bondi Walk The ultimate Sydney Harbour walk. Spit Bridge to Manly Walk A great contrast of pristine harbourside bushland and multi-million dollar mansions. Sydney City Walk The essential for walks around Sydney's green spaces. Watsons Bay Walk For views of the ocean, harbour and the city skyline. Sydney's Great Coastal Walk starts at Palm Beach in the north and walks the full length of Sydney's coastline south to Otford in Royal National Park. There are a couple of days walking the harbour from Manly to Bondi so why not do it all? It will take between a week or two, so plan it carefully. Wendy's Secret Garden The genteel harbourside area of the north-western shore of the Harbour Bridge. For Sydney Harbour walks, see also 24 Hours in Sydney's Outdoors for itinerary suggestions. Ian Wells of Sydney Coast Walks at Bradleys Head. Some of Sydney's best walks are in Royal National Park on Sydney's southern border. It's Australia's oldest national park, with more than 100km of walking tracks to explore. The Best Royal National Park Walks includes a list of walks in Australia's oldest national park, as well as general information about the park, such as getting there, costs and parking. If you're interested in doing a few Royal National Park walks, see also Royal National Park Accommodation. The Coast Track, one of the best Sydney walks, found in Australia's oldest national park. Guidebook – including walking tour commentary and map – available for the Spit to Manly Walk (buy the guidebook now $5.99). Coogee to Bondi Walk, also suitable for the Bondi to Bronte Walk (buy the Bondi map now $2.49). Figure 8 Pools (buy the Figure 8 Pools map now $2.49). The Coast Track, Royal National Park – suitable for full 2-day walk or day walks including Wedding Cake Rock (buy the Royal National Park map now $2.99). See availability of all self-guided walking tours in Sydney. You'll learn in our tips for whale watching season that the high vantage points from cliff walks also makes these some of the best whale watching places in Sydney. Barrenjoey Lighthouse Walk and the headland overlooking Palm Beach. South Head Walk around the headland at Watsons Bay. The Coast Track in Royal National Park. Wedding Cake Rock. Sandstone cliffs don't get whiter than this one. Rather than list hiking places in Sydney in alphabetical order, we've listed these overnight Sydney hiking trails in order of time to complete. Starting with the two day or long one day hikes, through to the hiking tracks that will take you a couple of weeks to complete. 2 day Coastal Track, Royal National Park, camping at North Era. See also The Coast Track One Day or Two? if you'd prefer one full, challenging day walk. If you love bushwalking (that's what Aussies call hiking) this is hiking Sydney at it's best. 27km (16 miles) of near pristine bush and coastal walking. 2 day Karloo Pools circuit. An easy day walk becomes an even easier overnight loop. 2 or 3 day Palm Beach to Manly Walk. Walk the full length of Sydney's northern beaches from Barrenjoey Headland to North Head. Although it can be walked in one long day, two or three days is much more chilled. 2, 3 or 4 day Manly to Bondi Walk. The ‘must-do' Sydney Harbour walk. If you only have time for one harbour walk, make it this one. 10 days Sydney's Great Coastal Walk Walk the length of Sydney's coastline over ten days – no camping required! Itinerary suggestions from as short as five days up to a leisurely fourteen days. Bondi to Bronte Walk One engraving in the most overlooked of places. Figure 8 Pools This is where you'll see the Aboriginal Canoe Tree right beside the track. Jibbon Aboriginal Carvings and Jibbon Aboriginal Midden for one of the largest and most accessible Aboriginal sites in Sydney. The Spit Bridge to Manly Scenic Walk – in particular the Grotto Point Aboriginal Engravings and Reef Beach. The Aboriginal canoe tree on the walk to Figure 8 Pools. Sydney Charity Walks A comprehensive list of every walking event in Sydney, Wollongong and the Central Coast, continually updated throughout the year. Interesting characters at the Royal National Park cabins. Best Walks in Sydney for Whale Watching Six best Sydney walks during the annual whale migration June – November. Which walk is the best of the best Sydney walks? Judging the best Sydney walks in is tricky because everyone has different views on what makes a great walk. Sydney bush walks vary from a short stroll through the local patch of eucalypt to multi day walks through the Blue Mountains. Sydney coastal walks are equally varied; the Bondi to Coogee Walk is easily accessible and more crowded but the Barrenjoey Lighthouse Walk is more challenging and therefore more quiet. Let’s just say Royal National Park Coastal Walk is our favourite because it has everything that every other Sydney coastal walk has combined … except the crowds and other signs of human development. This stretch of coastline is nearly the same as it was for thousands of years before European arrival. Sure there are day trippers at Wedding Cake Rock, Wattamolla, Garie Beach and Figure Eight Pools on sunny weekends, but the tracks between them are deserted. There are still some pristine beaches that you will have to yourself even after reading this blog post. Is it safe to hike alone in Sydney? Best Time to Visit Sydney paying particular attention to the best weather for walking in Sydney. Find Walking Groups in Sydney You never need walk alone if you don't want to; there are plenty of options to choose from. Sydney Walking Resources for weather forecasts, national park closures, fire warnings and more.